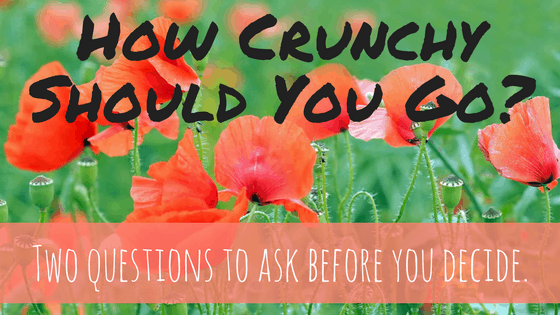 How Crunchy Should You Go? 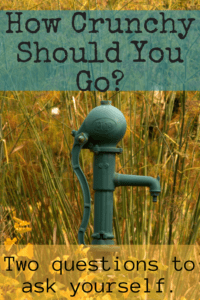 Two Questions to Ask Before You Decide. You are here: Home / Family / How Crunchy Should You Go? While talking to a group of ladies at my church a few months ago, a woman was telling a story about the last time she worked as a labor a delivery nurse. I was waiting for the part that would offend me when I realized my friend was putting me in the same category as this unshaven, pain loving, deadlocked woman! At first, this comparison truly baffled me. I mean, I shave my legs as often as a mother of four reasonably can, I am a huge fan of epidurals, and though my hair can be a curly mess, I often straighten it for church. Then, as I was grating soap to make laundry detergent, it hit me. I am sort of crunchy. according to Dictionary.com the informal definition of “crunchy” is health conscious and environmentally aware. The first part definitely fits me and does influence a lot of my decisions, but environmentally aware? There are really only two reasons that I ever go the more difficult route into that crunchy territory – health and finance. It is almost always cheaper and usually healthier to make something yourself. how crunchy should you go?? For me, this breaks down into a value question. I can’t make everything homemade. It simply isn’t reasonable as a mother of four to think that I can revert back to prairie living and do it all myself. So, I have to choose which things are worth my time and effort and which things simply aren’t. The way that I make that decision is a two-part evaluation process. Part 1. Is it a worthwhile financial savings? As I said earlier, it is almost always cheaper to make things yourself, but is it worth your time? Often times, mothers, stay-at-home mothers especially, forget that their time is valuable. If you are spending an hour in the kitchen making homemade pasta, that’s an hour you are not spending playing with your kids, talking to your husband, reading your Bible, taking a bubble bath, etc. So just because it’s cheaper to make homemade pasta, is the twenty-five cent savings actually worth it? Sixteen ounces of pasta is $.89 at HEB. An hour of my time is worth more than that. Even if I just spend that hour relaxing and reading a good book, it has still been an hour better spent. For some people, homemade pasta is worth their time. They enjoy being in the kitchen or they are pasta connoisseurs or they are super fast at pasta making. Homemade pasta aside, there are lots of homemade things that I do find to be worth my time. This post, How Crunchy Should You Go. contains affiliate links for your convenience. This means that if you make a purchase using our links, we’ll receive compensation at no additional cost to you. Read our full disclosure policy. We make our own hand soap by mixing Dr. Bronner’s Castile soap and water and putting it in a foaming hand soap dispenser. We make our own bread and pizza dough in a bread machine that I bought for $10.00 at a Habitat for Humanity Restore. We use homemade shower cleaner (white vinegar and Dawn dish soap) to scrub our bathtubs. That way I can let my kids do it and not worry about chemicals getting on them. 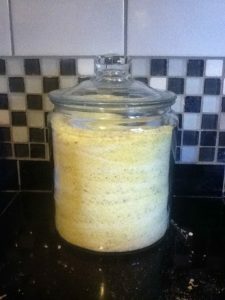 We make our own laundry detergent. It takes me about an hour to make, costs about $25.00, and looks super cute in a glass jar. This is enough detergent to last our family of six for at least eight months and we wash about ten loads per week. So, if you’re doing less than 520 loads per year, it should last you longer. I use this recipe from the website How Does She? But here’s the thing – for $15.00 you can buy a bucket of Wind Fresh laundry detergent at Sam’s Club that will do 200 loads. So, in this case, it’s actually cheaper to buy something already made. Which leads me to the second part of my evaluation process. Part 2. Is it a healthier choice for my family? There are often pre-made items at the store that are cheaper than homemade. So before I buy something based solely on financial benefit, I weigh the health benefit against it. Yes, we could Wind Fresh laundry detergent from Sam’s and spend less money and time than I currently spend by making ours homemade. Dax and Dutch have eczema and the girls have super sensitive skin, so it’s best for our kids to wear clothes washed in detergent that I make. It’s been a trial and error process to figure out which things are irritants for their skin (we can’t use anything scented). But now that we know, it’s simple. It’s also totally worth the hour and an extra $7.00 to not have to watch my kids suffer from skin irritation or buy expensive creams to treat the skin irritation. Sometimes, the cheaper, pre-made, store-bought stuff has cheaper ingredients too. And that’s where my line is. You have to evaluate based on your values. If your family is going through a season of reduced spending, then cost is going to be the driving force behind your decisions. If your family is trying to live more “green”, then ingredients are going to be the driving force behind your decisions. The overwhelming part comes when you’re trying to live frugally and greenly – which is where my family is. We simply can’t afford to buy everything organic, non-GMO, BPA free, phthalate free, conscientiously made or whatever the newest buzz word is. So, we weigh the financial savings against the health savings, and we make the best choice for our family. And then, here’s the tough part for me, once the decision has been made, we move on. We don’t beat ourselves up about past decisions when new information comes to light. We don’t feel like horrible parents because we ate Totino’s Party Pizzas for dinner last Tuesday. We just do the best that we can for our family on that day, and then the same thing on the next day. Because really, that’s most of what being a great parent is – doing your best for your family every single day. What crunchy habits do you think are worth your time and effort? What things have you discovered to not be worth it for your family? Tell us in the comments!